Accreditation - Local & National Electrician, Electrical Contractor, Electrician In - Stirling, Alloa, Falkirk, Glasgow, Edinburgh, Scotland. We are an approved member of SELECT - The Electrical Contractors Association of Scotland. Our electrical work is regularly audited by SELECT to make sure our work complies with regulations and that our company operates correctly including health and safety and employee relations. Founded in 1900, SELECT is an independent and autonomous association representing the interests of members, driving up industry standards, ensuring that work carried out by member companies is of the highest quality and training the electricians of the future. 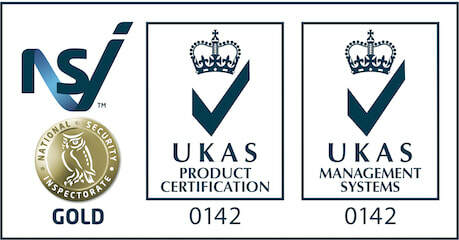 In February 2016 just three months after the launch of our intruder security alarm service our 'Stirling Alarms' branded service was awarded approval in the Design, Installation and Maintenance of Electronic Security Systems including Access Control, CCTV Systems and Intruder Alarms by the National Security Inspectorate (NSI) who are the leading approvals and certification body that inspects companies providing home security, business security and fire safety services. Then in August 2017 after a rigorous technical and quality management system audit we were awarded NSI NACOSS GOLD status enhancing our NSI accreditation to BS EN 9001:2015 standard. With all the security system advice on the internet, it can be bewildering knowing who to trust for sound advice and service. Choosing NSI GOLD approved Stirling Alarms gives you peace of mind that you are dealing with a reputable contractor who works to NSI’s stringent standards and also to the highest recognised industry standards as demanded by the Police, Fire & Rescue Services and insurance industry. We are inspected by an approved inspector of the NSI bi-annually to ensure all office procedures, maintenance & installations are being carried out to the highest standards & comply with regulation. View more information on our NSI accreditation. We are proud to be a member of Which? Trusted Traders scheme and are the first electrical business in the Stirling, Falkirk and Alloa area to do so. Based on positive customer feedback and a rigorous assessment process we were accepted into Which? in March 2015. Stirling Electrical Services Ltd. are a founding member of the UK wide Buy With Confidence Scheme which is operated locally by the Trading Standards depertments at Stirling and Clackmammanshire Councils. We have been vetted and approved by Trading Standards to ensure that we operate in a legal, honest and fair way, with our company and employees having passed strict entry guidelines. The scheme provides consumers with a list of local businesses, which have given their commitment to trade fairly. Membership is not awarded easily; every business listed has undergone a series of detailed checks before being approved as a member of the scheme. Stirling Councillor Danny Gibson said: "We are delighted to promote the Buy with Confidence scheme to local consumers as they can be assured that these traders have demonstrated to Trading Standards that they trade fairly and meet the high standards set by the scheme". Brian Wilson, Trading Standards Officer at Stirling Council said "Only when all the scheme requirements are met, is a business granted membership. Their conduct continues to be monitored thereafter. Whilst it cannot be promised that "Buy With Confidence members" work will be perfect every time, it can be expected that any problems are dealt with fairly by the business, and consumers can turn to Trading Standards for advice in the event of an unresolved issue"
Stirling Electrical Services Ltd. have been appointed as an Approved Body and we employ Approved Certifiers of Construction (Electrical Installations to BS7671), under the new Local Authority Building Warrant Scheme, which is the Certification of Construction (Electrical Installations to BS7671). Electrical Installations Certification involved within Building Warrant work in domestic and non-domestic should now be completed by an Electrical Approved Body and Certifier under the new Scottish Building Regulations 2004. We are are a trained installer for the UK's biggest fire products manufacturer, AICO. All our electricians have undertaken training on AICO fire and smoke alarm products and regulations. We are registered with SEPA - The Scottish Environmental Protection Agency where we are licensed to carry waste products. The Scottish Environment Protection Agency (SEPA) is Scotland’s environmental regulator whose main role is to protect and improve the environment.